WESG champion INnoVation received a sour welcoming back in GSL Code S, suffering round of 16 elimination just days after defeating Serral for the WESG trophy. Instead, it was Classic who topped Group C, making good on nearly a month of uninterrupted preparation since his opponents had been revealed. Trap came through in second place in the group, breaking a lengthy Code S jinx that had seen him mired in the RO16 for over five years. I hope Classic wins this. He deserves a GSL trophy. AfreecaTV activated the INnoVation Protocol in order to RE:Generate the GSL. Now that the mission is accomplished, it's been put offline. There's a way to disable spoilers on the main page if I'm not mistaken. Try looking at your account settings. Somehow, I would like to see Bunny win the GSL just to see how much he would cry. Right? I have no idea why the guy thought he "technically" had two. 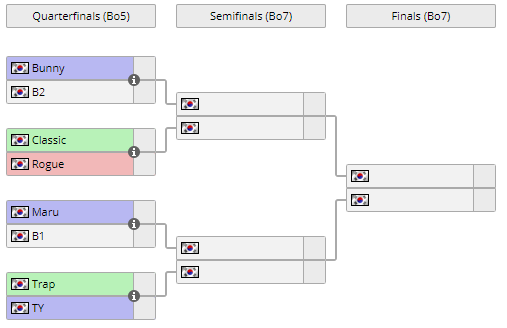 "soO wins IEM Katowice 2019"
"soO out in RO16, Maru squeaks into Code S quarterfinals"
"INnoVation defeats Serral to win WESG 2018"
"INnoVation out, Classic & Trap advance in Code S"
Well, my liquibet is partially dead -.-" Grats Classic and Trap! Like it's surprising? Only reason Inno won WESG is because he lucked out and dodged Protoss.